The oldest known figurative art in Europe dates to circa 35,000 BC, predating the famous Venuses by 5,000 years. The female mammoth-ivory figurine was discovered in a cave in southwestern Germany in 2008. The small figurine is called The Venus of Schelklingen after the area in which it was discovered. Archaeologists assume it is an amulet related to fertility. In place of the head, the figurine has a perforation so that it could be worn as a pendant. The figurine was discovered ten feet underground broken into fragments with the left arm and shoulder still missing. The area also yielded a carved waterbird, and a carved horse head dating from 31,000 to 28,000 BC. 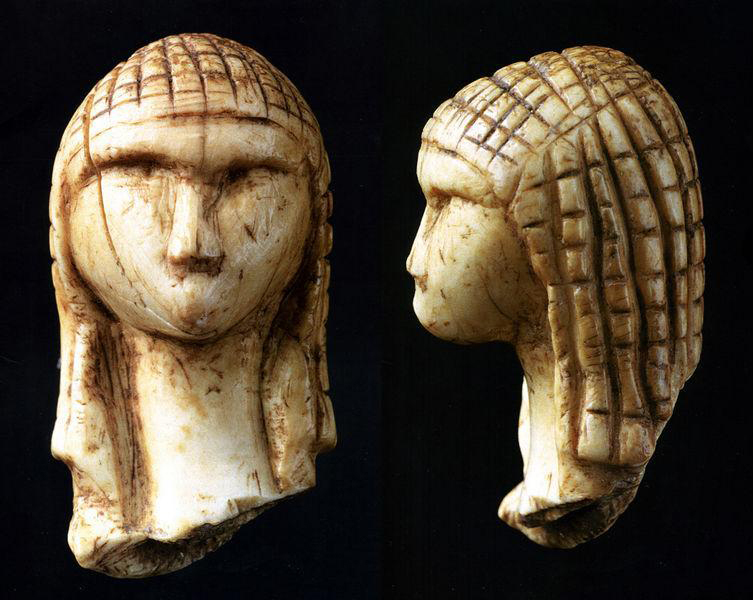 The Venus of Brassempouy, an ivory figurine fragment discovered in France in 1892 is one of the earliest known realistic representations of a human face. It dates to circa 23,000 C. The head is about 1 ½” high. On the head is a checkerboard-like pattern formed by two series of shallow incisions at right angles to each other; possibly a wig, a hood, or simply a representation of hair. The lion-headed figure is the earliest zoomorphic/ anthropomorphic sculpture dating to circa 30,000 BC. The lion-headed human figure which was discovered in Ulm, Germany stands less than 1 ½ high. The first pieces were discovered in 1939 with additional pieces coming to light in 1997-1998 during a formal excavation. The resemblance to figures in the French wall paintings and the discovery of an additional lion-headed figure suggests a cult of some sort.